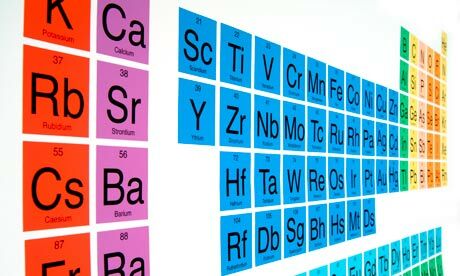 There’s an old joke that says that the astrophysics periodic table consists of three things: hydrogen, helium and metal. The reason for this is that hydrogen and helium make up about 98% of the atoms in universe. Everything else on the periodic table, from lithium on down, make up only 2% of atoms. On a cosmic level, these “metals” are just trace elements in the hydrogen-helium universe. The nucleosynthesis period also produced a tiny amount of lithium, about 1 lithium atom for every billion hydrogen or helium atom. We can actually use this fact to learn things about particular stars. For example, the atmosphere of our sun has only about 1 lithium atom for every 100 billion, or about 1% of the number you might expect. So what happened? Where is the missing lithium? The answer has to do with the way stars create new atoms. In the core of a star, hydrogen atoms are fused into helium atoms, which releases energy. This works because of the strength at which the nucleus of an atom holds itself together, known as its binding energy. Since the binding energy of helium is higher than hydrogen, producing helium from hydrogen releases energy. This is true for other elements as well. Helium to carbon, nitrogen and oxygen, and so on up to iron. Iron has the highest binding energy, so fusing elements beyond iron actually costs energy. 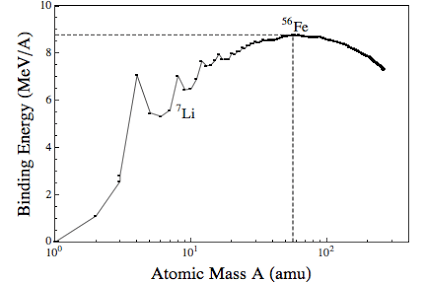 In the figure below, I’ve plotted the binding energy of different elements. You can see how it curves up to iron. You’ll also notice that there are regions where the binding energy dips, and lithium is in one of those dips. This means that while many atoms can release energy when they are fused, lithium is an energy loser. As a result, the same process that creates heavier atoms like oxygen and iron also reduces the amount of lithium. Basically, some of the lithium is burned away in the process of making heavier elements. Since our sun has less lithium than expected in its atmosphere it must have been formed from material that was once in the core of a star. 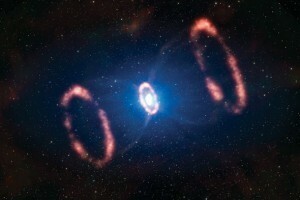 That means our sun is not one of the first stars of the universe, but rather formed from the remains of earlier stars. Given the missing lithium and other evidence, our sun appears to be a third-generation star. That means that means our sun is a grandchild of the first stars of the universe. Two generations of stars lived and died before our sun formed.